Ariana Grande's brother is breaking his silence on the sudden death of her ex-boyfriend, Mac Miller. E! News learned on Friday that Miller (née Malcolm McCormick) passed away after an apparent overdose. The Los Angeles County Coroner confirmed in a statement that authorities were called to the artist's home in Studio City, Calif. on Friday. He was pronounced dead at the scene at 11:51 a.m. The following day, Grande took to Instagram to mourn his death. The 25-year-old "God Is a Woman" singer posted a black-and-white photo of Miller, who she dated for about two years, sitting on the ground looking up at the camera. 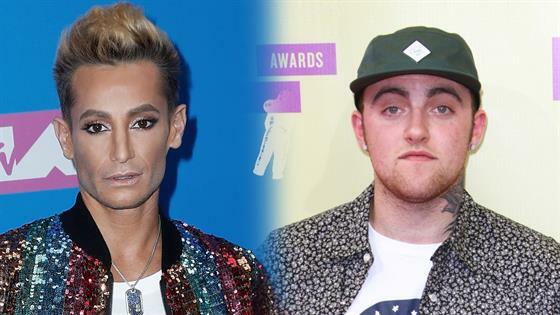 On Wednesday, Grande's brother, Frankie Grande, took to social media to mourn the 26-year-old rapper's death. "I am beyond heartbroken over Malcolm's death," Frankie began. "He was a good friend and was wonderful to my sister. He was the reason I went to the rehabilitation center where I was detoxed safely from all of the drugs alcohol and medications I was taking, when I couldn't imagine living without them. It was the place where I found the community of support that showed me that living life without drugs was a possibility and I would never have discovered that if it weren't for Malcolm. I remember when I would get 30, 60, 90 days clean and Malcom would be there with a gift and a card and words of encouragement... telling me that he knew how hard getting sober is and how impressed he was that I was succeeding." "Addiction is a TERRIBLE disease… many people are suffering from addiction like I am and many many of them are losing," he continued. "Those of us who are struggling with addiction must stay strong. We must continue to work HARD on ourselves every single day and help each other. Our disease is strong but WE ARE STRONGER and I vow to work every moment of my life to keep myself sober so that i may be there for others. This is a difficult road but YOU DO NOT HAVE TO TRUDGE IT ALONE." "To anyone who needs help, help is there," Frankie told his followers. "You just need to have the courage to ask, which I know can be EXTREMELY difficult... but when you do I GUARANTEE support will be there. do not be ashamed if you are losing the battle against addiction, shame feeds the disease, humility defeats it. please ask for help! you are NOT ALONE! I am here... and I will continue to be here... for you... Malcom my friend, you will be dearly missed. and I know you will be looking down on me from heaven, proudAF for every day I live my life clean and sober... 453 days and counting... Thank you from the bottom of my heart." Frankie also included the numbers for Alcoholics Anonymous (212-870-3400), Narcotics Anonymous (818-773-9999) and the National Suicide Prevention Lifeline (800-273-9255).